> What’s new about the Novel Foods Regulation? A number of recent publications and initiatives have dealt with the important issue of gendered approaches as a means of curbing the generalised decline in food security and livelihood opportunities, especially in rural and disadvantaged areas of developing countries. While rural women and men play complementary roles with regard to food security, women play a much more important role when it comes to natural resource management and to ensuring nutrition. Hence, climate change adaptation and the search for new approaches to guarantee families’ subsistence are primarily the result of women-led initiatives. According to the IFPRI report, if interventions to strengthen women’s control of natural resources are to succeed, they must take account of local gender norms. One area where this type of intervention could be required is the issue of tenure of and access to land, soil and water. In Cameroon, for example, an irrigated rice project did not assign women land because they were expected to work in their husbands’ fields, which they indeed did. They then ceased growing sorghum, a crop intended to feed their families, outside the irrigation scheme. The project failed in one of its objectives, namely strengthening women’s rights to land. Other areas requiring intervention include the introduction of new crop varieties and technologies, as well as access to training, markets and financial services. In Bangladesh, where women risk disrepute by working outside the home, a group of females successfully adopted improved vegetable technologies disseminated by a women’s NGO because they were able to grow these vegetables on their own homestead. 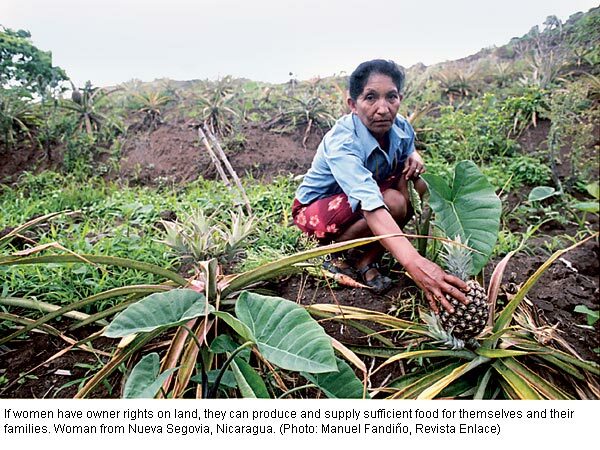 The Nicaragua-based journal Guacal dedicated a recent issue to the battle for women’s access to land. With backing from the women’s platform for food security and for food and nutritional sovereignty, a demonstration was held in October 2008 to demand women’s land tenure rights. According to one representative, “…women are unable to avail of credit because they do not actually own the land that they cultivate”. Fierce criticism has been levelled at a new bill – the “Law on the creation of funds to assist land purchases based on the principle of gender equality” – which is currently being drafted. The women’s platform hopes that any changes to the bill will not overlook the issue of a woman’s right to own the land on which she works. In addition to exploring the question of what should happen to such land titles in the event of separation or divorce, this special issue also comments in detail on the aforementioned draft legislation. The third publication examines the impact of climate change on gendered approaches as well as the relation between the two, particularly with regard to natural resources. Recent evidence shows that women who have already started to feel the effects of weather-related disasters (erratic monsoon patterns, flooding etc.) are developing strategies which require them to adapt their farming practices. In the Ganga river basin (Bangladesh, India and Nepal), for example, local women have switched to flood-resistant crops or to ones which can be harvested before the monsoon season; they also now cultivate other varieties of rice which grow high enough to remain above water when the floods come. There is a common theme which runs through each of these three articles, namely the importance of human and social capital, whether it be safeguarding families’ livelihoods through investment in education, health, and women’s nutrition, or the promotion of women’s associations. > For more information on this topic (in French only): Genre, femmes rurales et développement. Rubriques Accès à la terre et aux ressources naturelles et Sécurité alimentaire. China’s and India’s economies have grown rapidly over the past 25 years. Both the “dragon” and the “elephant” have implemented comprehensive economic reforms. The fact that they have taken very different approaches makes it all the more interesting to explore the lessons that can be learned for the future and for other countries. China has invested heavily in agricultural infrastructure and research, and has facilitated access to land. This has enabled the country to reduce poverty substantially over a short period of time. Food supply has improved, and rural income has risen. In comparison, India’s policy of subsidising agricultural inputs and food prices has been less successful. At the same time, however, India has gained positive experiences with decentralised and participatory approaches, which have enabled agricultural development programmes to better target specific poor population groups. China’s nationwide, top-down measures failed to achieve this precision. In future, according to the authors, both countries should focus on enhancing the efficiency of resource use and of administrative processes. Furthermore, efforts must be made to promote agricultural education and social protection measures. Due to this publication’s main focus being on poverty reduction, the ecological consequences of economic growth remain somewhat in the background. Adaptation to climate change is a slow process that bears many uncertainties and risks. In light of the varying responsibility of the different countries for climate change, on the one hand, and the varying levels of nationally available adaptation resources, on the other, the authors propose an international plan that foresees help for the economically weaker countries to be provided by the economically stronger. Moreover, the authors explain the interlinkages that need to be considered when devising such a plan. One crucial factor is the definition of the term “adaptation”: the broadness of its understanding determines whether the focus is only on climate change, which calls for a long-term planning horizon, or whether the goal is also to enhance resilience to extreme weather events. Another question that needs to be considered is whether existing development activities are, or should be, adapted to the changing climatic conditions. Evaluating the costs of this operation is difficult, and results vary widely depending on the approaches and methods used. This necessitates flexibility in planning. In addition, it is important to clearly separate this support of adaptation efforts from regular development cooperation in order to avoid competition for funding. The impacts of climate change and the ongoing food crisis have added momentum to the call for greater investments in African agriculture. Various donor organisations, but also African governments have already declared their intentions to step up their commitments. This welcome change of trend raises the major question of where and how to invest. This report gives a brief overview of the political priorities of the most important donors engaged in African rural development. The authors show that discussions centre around five main themes: aid efficiency, market contribution to growth, the future of small-scale agriculture, improving governance, and the increasing assumption of responsibility by Africa itself. According to most donors, the market and the private sector are crucial for rural development. However, the state has an important role to play, as well: among other things, governments should strongly increase their efforts to foster research and the development of adapted technologies. The various donor organisations disagree over many of the issues at stake; this is the case also for the question of how to support small farmers. Source: More Aid for African Agriculture. Policy implications for small-scale farmers. UK Food Group. 2008. 42 p.
The fact that greenhouse gas emissions are on the increase worldwide is in conflict with the emission goals defined up to 2012 in the Kyoto Protocol and the various framework treaties. Scientists point out shortcomings in implementation, but they also criticise the fact that agriculture and forestry have not been adequately integrated into international efforts: for example, both sectors have been systematically excluded from trade in emission certificates. Land use, land-use change and forestry (LULUCF in short) have a great potential for climate protection. The authors provide comprehensive insights into the possibilities that LULUCF offer in terms of climate change mitigation. The report includes several suggestions for adaptation in agriculture and forestry, as well as LULUCF-specific recommendations regarding the post-2012 climate regime. One chapter is dedicated exclusively to LULUCF in developing countries. A large share of the forests in these countries are degraded or completely destroyed. Given the importance of forests with regard to carbon sequestration, in future more efforts must be directed at forest restoration. Moreover, these efforts must benefit the local populations both economically and socially. Climate protection and development goals can indeed be linked together in a win-win setting. Source: Key issues on land use, land use change and forestry (LULUCF) with an emphasis on developing country perspectives. Carmenza Robledo and Jürgen Blaser. Intercooperation / UNDP. September 2008. 49 p.
What’s new about the Novel Foods Regulation? The EU Regulation on Novel Foods and Novel Food Ingredients (EC No 258/97) was adopted in 1997 with the aim of establishing standardised rules for novel foods to ensure human health and protect consumers. The regulation defines ‘novel’ food as a food or ingredient that has not previously been used for human consumption at a significant level within the EU – regardless of whether it has been eaten safely elsewhere over centuries. Extensive scientific data are required to prove its safety. 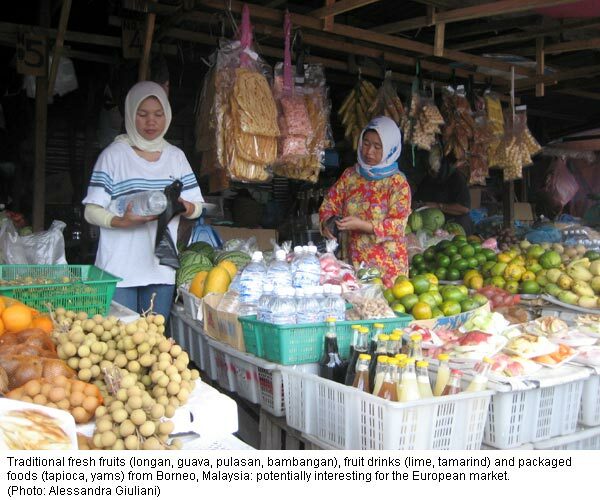 Since the definition of novel food includes traditional foods from developing countries, this regulation has created critical barriers to producers in poor countries wishing to market their products in Europe. The regulation is now under revision with a view to finding a more precise definition both of a product’s novelty and of how to assess its safe use. A final regulation might be adopted next June. There is a risk that this revision will generate additional hurdles for producers and exporters from developing countries. Interested parties should therefore seize the opportunity to contribute to the revision process. Producers’ experiences in dealing with the regulation can serve as a basis for improving the procedures for assessing information on novel food products. International, regional and exporting governmental institutions should mobilise stakeholders to ensure that their interests are taken into consideration. The time to contribute is running short, so action must be taken now! In Mairana Valley, Bolivia, 250 small peanut producers, an exporter, the local government and a provider of agricultural extension services have joined forces. The goal of their partnership is to improve productivity and competitiveness in peanut production. The authors have analysed 125 public-private research partnerships in Latin America and published their results in a guidebook. The book gives a detailed description of the various aspects to be considered when building partnerships for innovation: identification of shared interests, funding schemes, legal aspects, organisational design, implementation, and evaluation. According to the authors, an important prerequisite for public-private partnerships (PPPs) to be successful is the commitment of all partners involved, along with transparency and an atmosphere of trust between partners. PPPs in agricultural innovation and research can have various advantages for the different partners, for example reduced risks and costs or increased quality and relevance of the solutions developed. However, the PPPs must be adapted to their specific context, and in some situations they are not the ideal solution. The main challenges for empowerment are to alleviate poverty and to transform power relations that have led to certain population segments having less opportunities than others to shape their lives. More and more, it has become an acknowledged imperative not only to understand the underlying causes that explain why some people and groups in society are more powerful than others, but also to discuss and implement mechanisms and strategies that may contribute to generating equal opportunities, building capacities, and ensuring equitable access to resources. In this context, in 2005 the ASOCAM Latin American Network launched a regional process of reflection and inter-learning among thirty development organisations from seven countries. Resulting guidelines and products have now been made available through a new thematic website. The website offers reflections on concepts and approaches to empowerment, including articles and theses by Latin American experts. The topic is explored in its social, political and economic dimensions, and strategies for implementation are suggested. The website also provides indicators for monitoring and evaluation, a complete virtual library, and links to organisations specialising in the topic. Biofuels are currently the object of much controversy. Produced in a sustainable manner, they could contribute to mitigating the energy crisis and slowing climate change. However, at present they are associated more with loss of biodiversity and with food shortage. This situation calls for clear criteria to regulate their production and trade. The UNCTAD publication demonstrates that certification programmes are an option for supporting sustainable production of, and trade in, biofuels. To achieve this goal, existing programmes must be coordinated and criteria need to be given a flexible wording that allows for adaptation to different ecological and socio-economic conditions. Moreover, certification programmes should be based on participatory processes and linked to incentives to increase their attractiveness. One example of principles and criteria for sustainable production of biofuels is provided by the EPFL Energy Center initiative. Elaborated by a number of stakeholder groups, the criteria focus on producers and on the national level. They address different aspects, such as soil and water conservation, legal issues, human rights, leasing relations, and others. > Global principles and criteria for sustainable biofuels production. Version Zero. Roundtable on Sustainable Biofuels. August 2008. 9 p.
Kenya is currently experiencing the highest inflation rate in recent years (27%). Food prices are rising, and the number of urban poor is on the increase, accounting for approximately 58% of the absolute poor. One coping strategy is urban farming. This practice occurs in all urban centres, occupying every open public space. Kibera slum in Nairobi City is one example. The slum holds a quarter of the city’s population and accounts for 60% of urban farmers, 64% of them being women. As an alternative to illegal trades, farming supplements food supply and generates income for the poor. Kibera is the second-largest slum in Africa. Its urban farming plots spread over large open spaces across River Mutoine and Nairobi dam. Cropping seasons are from October to December and from April to July. Maize, beans and vegetables are the dominant crops, and few farmers keep livestock. Farming plots are small, and nobody has recognised legal rights to the land or its use. Eviction is a daily occurrence and limits the farmers’ motivation to conserve the soil. Land is accessed through social means. Agriculture helps to meet the families’ food requirements, and the sale of surplus produce generates income. Non-farming families are far worse off than urban farmers due to the high prices of staple foods and fresh produce in Nairobi. > The New Farmer. Dagi Kimani. All Africa, September 2008. > Policy Prospects For Urban And Periurban Agriculture In Kenya. George Ayaga et al. Urban Harvest 2005. The Swiss forestry industry in the Congo Basin has embarked on a new form of dialogue, based on the concept of “free, prior and informed consent (FPIC)”. This type of approach should help encourage not only sustainable forest management but also the consideration of the interests of forest peoples. 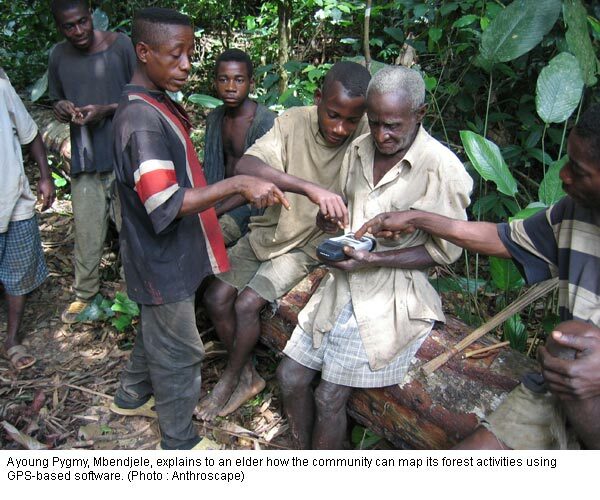 The result of field research in seven concessions held by five forestry companies in the Democratic Republic of Congo, the Republic of Congo and the Gabon, this innovative report shows how FPIC helps define and regulate contractual relationships between economic stakeholders, the state and local communities. The report also notes that the FPIC follows Certification Principles 2 and 3 of the Forest Stewardship Council (FSC), concerning the rights and responsibilities associated with land tenure and use on the one hand, and the recognition of the rights of indigenous peoples to own and manage their territories and resources on the other. Negotiating consent means that forest peoples have the right to say “no” to forest exploitation, which, of course, poses problems for the forestry industry. While such a rejection is far from absolute and often leads to further negotiations, the right to express an opinion – positive or negative – helps build the confidence of the local communities and strengthens their feeling of power. The fact that the FPIC is recognised by international accords, such as the United Nations Declaration on the Rights of Indigenous Peoples, the ILO Convention 169 and the Convention on Biological Diversity, should encourage the three aforementioned countries, and eventually other countries in similar situations, to incorporate this principle in their national legislation.